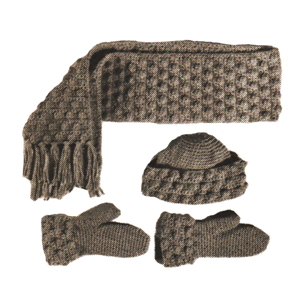 Set requires about 16 ounces knit­ting worsted weight yarn and crochet hook size I or size needed for gauge. Row 1: Sc in second ch and in each ch —21 sc, ch 1, turn. Row 3: * Sc in each of next 3 sc, 3 dc in next sc—holding last lp of each dc on hook, yarn over, pull through all 3 lps on hook—puff st made, repeat from * across, ending sc in last sc, ch 1, turn. Rows 4, 5, 6: Work even in sc. Row 7: Sc in next sc, * puff st in next sc, sc in each of next 3 sc, repeat from * across, ch 1, turn. 60 inches or desired length, fasten off. Sc along side edges. Attach six strand fringe along each end. Rnd 1: Work 6 sc in second ch from hook, mark beginning of rnds. Rnd 2: 2 Sc in each sc. Rnd 3: Sc around, inc 6 sc evenly spaced. Repeat rnd 3 until there are 54 sc. Work even in sc until 6-1/2 inches from beginning, ch 1, turn. Inc 15 sc—69 sc, ch 1, turn. Next 2 Rows: Work even in sc. Work pattern rows 3 through 10 until four puff st rows are completed. Work one row sc, fasten off. Sew back seam, turn back brim. MITTENS: Make 2. Starting at wrist, ch 24, join. Rnd 1: Sc in each ch. Rnd 2 through 5: Work even in sc. Row 6—Thumb Inc: Sc in 11 sc, 2 sc in each of next 2 sc—thumb, 11 sc. Rnd 7: Work even. Rnd 8—Thumb Opening: Sc in 10 Sc, ch 4, sk 8 sc, sc to end. Rnd 9: Sc in each sc and in each ch. Work even on 22 sc until 4 inches from opening or one inch less than decs. Tip: Dec 1 sc above thumb opening and at opposite end. Repeat last rnd four times, fasten off, leaving length of yarn. Sew edges to­gether. Thumb: Work 12 sc around opening. Next Rnd: Dec 1 sc. Work even on 11 sc for 2-1/2 or desired inches. Dec 1 sc five times, fasten off. Sew together. Cuff: With right side of work facing, starting at opposite end from thumb, work 33 sc across starting ch, ch 1, turn. Work pattern rows 3 through 10 until 3 puff st rows are completed. Next Row: Sc in each sc, fasten off. Sew cuff seam.